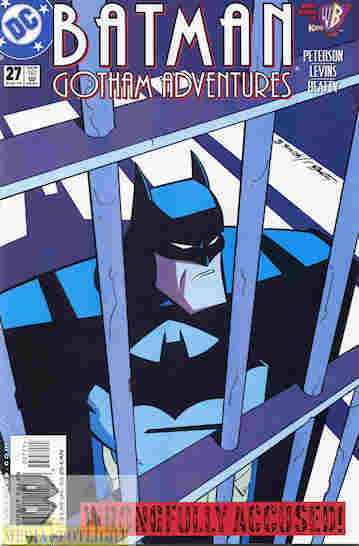 The number of continuities in which Batman doesn’t end up in jail at least once is surprisingly low. A professor claiming to be wrongly accused of murdering a mob boss seeks Batman’s help in clearing his name. As the investigation begins it does seem odd that a law professor that everyone liked and never had any direct dealings with the mob would be framed, the finger being pointed at a since deceased rival boss. Then Batman and Batgirl figure out that the professor actually was involved, hoping to take over the murdered boss’s turf. So instead of being cleared more charges are levied against him. Like his prison pals could have told him, you can’t outsmart Batman. What they got right: There aren’t enough stories in my opinion that focus on Batman’s detective skills. This one shows Batman and Batgirl putting clues together and figuring out the villain’s plan. There are also some fun moments that highlight the odd relationship Batman has with the criminal underworld. There’s also a scene where Batman is in a bit with one of his “informants” looking down on him and even with the man joking you know Batman has the advantage. What they got wrong: I actually don’t have anything to complain about. There are fun scenes, plenty of action, and good detective work as the reader has to join in putting the clues together. Recommendation: This is a good example of how to write a proper Batman story. Highly recommended. Posted by ShadowWing Tronix on April 1, 2019 in Animation Spotlight, DC Spotlight, Television Spotlight, Yesterday's Comics and tagged Batgirl, Batman, DC animated universe, DC Comics, DCAU.